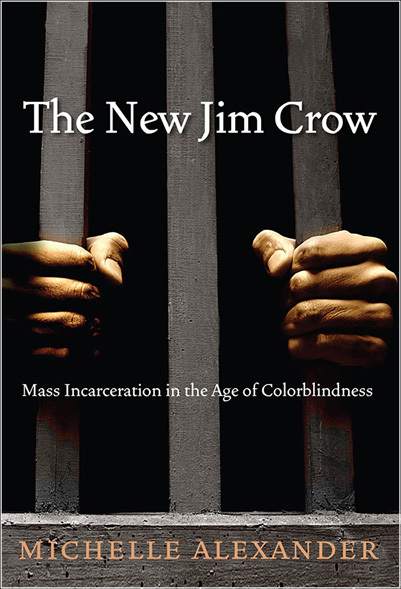 In The New Jim Crow: Mass Incarceration in the Age of Colorblindness, Michelle Alexander details the history of how the United States now has more people in prison or in jails than any other nation, whether measured by raw numbers of prisoners held or by rate of incarceration. The U.S. prison population has grown dramatically—from 300,000 to 2 million in about thirty years—since the beginning of the War on Drugs made billions of dollars available for arresting, convicting, imprisoning, and paroling drug users and dealers. Alexander argues the War on Drugs is not merely a war against addiction to dangerous substances or the crime associated with the drug trade. Rather, it is largely a form of social control based on race that has created a caste-like system. She offers a compelling argument that the War on Drugs and mass incarceration are the latest forms of legal social control in the U.S. against people of color, particularly against African-American males. When slavery, the first legitimate system of control, eventually became illegal, the powerful white elites who sought to control the slaves did not give up their racist views with the adoption of the Thirteenth Amendment in 1865. They shifted their tactics to legally marginalize black people from participating in mainstream society through Jim Crow laws. Similarly, when Congress, the courts, and the states began dismantling Jim Crow, those who had interest in maintaining legal segregation did not give up their desire for racial marginalization. The tactics again shifted toward laws that were technically colorblind, but in actuality targeted people of color disproportionately. For example, the mandatory federal sentence for possession of crack cocaine, which is more likely to be used by African-Americans, is much stiffer than the sentence for possession of powder cocaine, which is more likely to be used by white Americans. Yet both forms of cocaine are essentially the same on the chemical level. In a thorough, fascinating, and angering account, Alexander shows how the laws at every stage of the criminal justice process are stacked against people to ensure their conviction and disenfranchisement. The New Jim Crow raises many issues Christians need to consider. We must investigate whether laws are fairly written and executed. Alexander shows a felony drug conviction in the U.S. is essentially a life-long sentence, for even when a felon is released from prison, he finds himself shut out of many forms of assistance and employers are largely free to reject his employment application sight unseen. Unlike many Western nations, most felony drug convictions in the U.S. disenfranchise people from ever voting or sitting on a jury. Christians believe in the truth of redemption, but what are we to do when it seems redemption is kept from our neighbors with criminal records? I won’t explore these questions in this post. Rather, I want to focus on a theological reality Alexander’s book demonstrates, namely, the insidious nature of sin and evil. Alexander persuasively argues the mass incarceration explosion in America has deeply racist roots while under the guise of colorblindness. Unlike slavery or Jim Crow, laws that “get tough on crime” do not technically target certain races, but specific behaviors. The results show, however, that these laws do target certain races more than others. The War on Drugs has negatively affected populations of color disproportionately despite the fact that rates of drug use and sales are similar across the races. People of color are far more likely to be arrested, charged, and convicted of drug crimes. They are more likely to be charged with more serious crimes than white suspects. Here we see sin’s insidiousness. To create and maintain the previous racial caste systems of slavery and Jim Crow, rich white elites preyed on the resentments and fears of poorer whites to garner their support. Though the working class white citizens gained little from slavery or Jim Crow—and, it could be argued, were in fact hurt by those systems—they became some of those institutions’ strongest proponents. Today, most people would never consciously support an overtly racist set of laws. If some people began to push for the return of Jim Crow laws, most Americans would oppose such legislation. Tough on crime policies, however, have proven especially popular among Americans of all races because we want safer neighborhoods. The trouble is that many of us are ignorant of the effects these laws have—I was unaware of just how much these laws have disproportionately hurt people of certain ethnicities. Alexander rightly reminds us that most people convicted of drug crimes are guilty of illegal behavior. Our natural and good desire for safety has been used to disenfranchise, hurt, and lock large numbers of our neighbors into a system without hope for redemption. Unlike slavery, the legal basis for mass incarceration cannot be done away with by one or two amendments to the Constitution. Unlike the dismantling of Jim Crow, there is not merely one law or one set of laws that could be rewritten in the legislature or struck down in the courts. Rather, the problem of mass incarceration emerges from a web of laws, policies, legal decisions, and popular opinion. Such is the way of sin. It subtly works its way into our lives so that we are unaware of its presence. We take it to be the norm. In fact we cannot imagine our lives without it. We can be unconscious supporters of and participants in its injustice. In 2012 voters in my state, California, approved Proposition 36, which revised the existing “Three Strikes” law to institute mandatory life sentences only on those convicted of serious or violent felonies. Opponents of the proposition offered many arguments against it, one of them being that it would release many people who had been in prison into our communities. Neither the convicts nor the communities would be ready for this reintegration. Worse, while these convicts went to prison for nonviolent offenses, being in that environment likely hardened them into violent criminals. The argument in this case was essentially it would be better to maintain the status quo and keep prisoners who had not committed violent crimes locked up. We sent them to prison because we deemed them dangerous and prison made them more dangerous so the safest thing to do, the only thing to do, was keep them in prison. Sin has convinced us that we cannot live any other way. As we consider how to respond to the serious problem of mass incarceration in the U.S., we should allow Abraham Joshua Heschel’s famous quotation regarding his opposition to the Vietnam War guide us into repentance. Heschel writes, “In regard to cruelties committed in the name of a free society, some are guilty, while all are responsible.” Though we are first citizens of Christ’s kingdom, we are also citizens of the U.S. As citizens of the U.S. we have to ask how have we been responsible for the dehumanizing policies of our nation? How are we responsible to the communities we rightly want to keep free of crime as well as to those who commit such crimes? Great thoughts Tyler. The first time I heard of the the discrepancy between crack and powdered cocaine was in a rap song by Murs called “The Science”. Its a good piece of social commentary and not a bad tune either. There are explicit lyrics, though. I’m ready to throw the drug laws in the trash can… I would support a drug users right to use drugs if they were also personally responsible for the potential consequences… I. E. Unable to hold down a job… Liberty without owning risk/consequence does not work. The nanny state is on both sides of the equation… They would have to be removed from both sides to work properly… This author seems to oppose the nanny state rules that keep our streets safer but doesn’t frets about the welfare that’s denied felons. Or in other words… You can’t have your nanny and eat her too..
Alexander is not calling for liberty without people being responsible for the consequences of their behavior. Rather, she points out how the current criminal justice system prevents drug felons from providing for themselves legally. Most job applications ask applicants if they have ever been convicted of or charged with a felony and employers are free to dismiss those applications, essentially shutting felons out of the job market. (Unemployment for released felons is especially high and not merely because of a lack of job skills.) She does support allowing them the ability to go back on government assistance when they need it. But because employers are allowed to dismiss felons sight unseen from the job application process and laws refuse them the ability to receive assistance, many felons return to crime to provide for themselves and their families. As well most people know that there is a difference between driving with a blood alcohol level of point 7 and point 8. This is not anymore racist than the enhanced charges for Crack. Crack is a more extreme version of cocaine. There is difference between haveing a couple of drinks and driving vs. Being smashed and driving. This is not racist. Equally true by my measure is the difference between being coked out and being cracked out. I have never consumed either of these substances but have been around people who have taken both. Cocaine left people much more social/happy go lucky. Crack seems to make people angry, harder to communicate with, and the intensity of the drug is for lack of better terms scary. I’m against all drug use charges (driving the exception) and all social bailouts for people who make these choices. But since we do have drug charges it makes since that pot charges would be lighter than coke, and coke lighter than Crack.